a double-S-shaped fissure extending obliquely upward and backward on the lateral surface of each cerebral hemisphere at the boundary between frontal and parietal lobes. a cleft separating the frontal from the parietal lobes of the brain. Also called central fissure, fissure of Rolando. A double S-shaped fissure extending obliquely upward and backward on the lateral surface of each cerebral hemisphere at the boundary between frontal and parietal lobes. pertaining to a center; located at the midpoint. of the optic nerve, the source of the retinal artery. See also Table 9.
the fast-flowing channel through the capillary bed, the rate controlled by the metarterioles which exert a sphincter-like action on the system. convulsions arising from stimulation of the central nervous system, as distinct from those caused by lesions elsewhere. injury to the central portion of the cervical spinal cord resulting in disproportionately more weakness or paralysis in the forelimbs than in the hindlimbs; pathological change is caused by hemorrhage or edema. 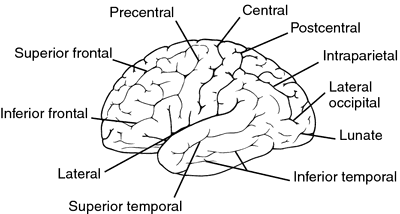 central of the three layers of gray matter in the cerebellum; the principal cell type is piriform. see central progressive retinal atrophy. the laws of physics applied to the primary x-ray beam of photons, e.g. the closer the object being x-rayed is to the film the sharper will be its definition. pool of nerve cells in the pons and medulla oblongata which are responsible for the rhythmic to-and-fro movements of respiration. the bone of the hock which lies between the proximal and distal rows of tarsal bones. the centrally placed drainage vessel of each hepatic lobule, receiving blood from the hepatic sinusoids. insertion of an indwelling catheter into a central vein for the purpose of administering fluid and medications and for the measurement of central venous pressure (see below). the pressure of blood in the right atrium, measured by an in situ catheter in the right atrium, is a much better guide of the degree of vasogenic peripheral failure than is arterial blood pressure. The technique is used mainly in dogs and cats.